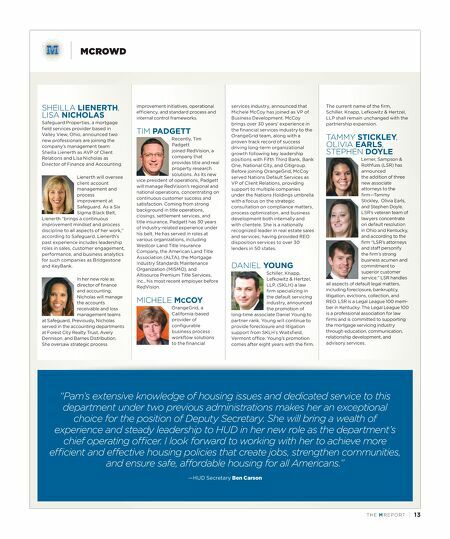 12 | TH E M R EP O RT MCROWD PAMELA HUGHES PATENAUDE President Donald Trump nominated Pamela Hughes Patenaude to be Deputy Secretary of Housing and Urban Development. Widely considered the real position of power at HUD, Patenaude's confirmation as Deputy Secretary would see her serve alongside HUD Secretary Dr. Ben Carson. Patenaude is the President and Founding Executive Director of the J. Ronald Terwilliger Foundation for America's Families and has a long history in the housing industry. She previously served as EVP of the Urban Land Institute; Director of the Bipartisan Policy Center Housing Commission; the HUD Assistant Secretary for Community, Planning, and Development; VP of Manor Homes Builders; and as an advisor to two presidents: George W. Bush and Ronald Reagan. She also worked with the New Hampshire Housing Finance Authority on implementing a Section 8 rental assistance program. THOMAS CURRY The Office of the Comptroller of the Currency announced the stepping down of Comptroller Thomas Curry on May 5. U.S. Treasury Secretary Steven Mnuchin appointed Keith Noreika as a Deputy Comptroller and designated him the First Deputy Comptroller of the Office of the Comptroller of the Currency (OCC). Curry had completed his five-year term on April 9, and had served on an extension since that time. Noreika is currently a partner at Simpson Thacher & Bartlett LLP and was a partner at Covington & Burling, specializing in banking regulation. RAY BARBONE During the annual National Mortgage Servicing Association (NMSA) member meeting in Washington, D.C., on April 5, NMSA announced the appointment of Ray Barbone, EVP of Mortgage Services at BankUnited, as the new Chairperson. Barbone assumed the position recently vacated by J.K. Huey, SVP at Wells Fargo, whose term ended in April. Huey won't be ending her service to the group near term however, as she was named chairman emeritus of NMSA in recognition of her decades of service to the mortgage industry and her longstanding support of the organization. Barbone brings several decades of experience to the NMSA. Prior to serving at BankUnited, Barbone was group SVP for operations at ABN AMRO Mortgage Group in Jacksonville, Florida, and before that spent 14 years as controller and SVP at Atlantic Mortgage & Investment Corp. ED DEMARCO Ed DeMarco, former Acting Director of the Federal Housing Finance Agency, has been tapped to head the Financial Service Roundtable's Housing Policy Council. DeMarco served as the Acting Director of FHFA from 2009 to 2014. According to FSR CEO Tim Pawlenty, DeMarco is coming at a pivotal time for the HPC. DeMarco previously served as a Senior Fellow in Residence at the Milken Institute's Center for Financial Markets, where he helped moved forward a number of pressing housing policy issues. He has also served as COO and Senior Deputy Director at the FHFA, as Assistant Deputy Commissioner for Policy at the Social Security Administration, and as Director of the Office of Financial Institutions Policy at the Treasury Department. WILLIAM J. TESSAR CIVIC Financial Services announced the hiring of William J. Tessar as its new president and CEO. Tessar most recently worked with Skyline Financial Company. Tessar brings over 30 years of experience to CIVIC, and has founded and served as President of three lending companies. Capital Line, one of his companies, was recognized as a top originating brokerage in the state of California. In 2007, Capital Line merged with Skyline Home Loans, and Tessar was named President of Retail Lending. In his 10 years at Skyline, he scaled the organization from a retail mortgage company funding $40M per month into a multichannel originator with $3.5B funded annually. JEFF BELL Jeff Bell has assumed the role of Chief Information Officer at LoanCare. Bell will be responsible for planning, organizing, optimizing, and managing staff and overall operations of LoanCare's IT department. He will provide strategic leadership to ensure operational services to the business are being supported in a timely and cost- effective manner, as well as developing objectives and short and long-term goals for the department. Most recently, Bell was a partner with Crystal Shores Consulting where he worked with mortgage institutions as a management consultant with expertise in mortgage technology. During his time there, Bell won awards for JD Power Customer Service Recognition and number one IDS FinTech 100 at TCS. FRANK GELBART Roostify has announced the hiring of Frank Gelbart as the organization's new Chief Revenue Officer. In his new position, Gelbart will be in charge of managing partner relationships and driving both new and existing streams of revenue. Gelbart comes to Roostify with two decades of experience in the enterprise software realm. He previously founded and served as President and CEO at Appfluent Technology, a business intelligence firm eventually acquired by Attunity. He also served as the VP of Worldwide Sales at Peakstone Corporation and as a senior manager at Entevo Corporation, Equinox Corporation, and Cheyenne Software. This experience will serve him well at Roostify, according to its CEO Rajesh Bhat. 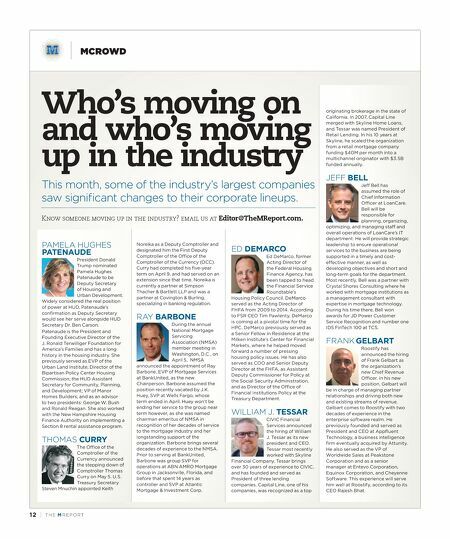 Who's moving on and who's moving up in the industry This month, some of the industry's largest companies saw significant changes to their corporate lineups. Know someone moving up in the industry? email us at Editor@TheMReport.com.